I am such a vulgirl. Vulgirl is a name my old apartment coined – it’s a combination of vulgar and girl, and has some hononymity with Vulcan. It was a slur we would throw at each other when we were being creepy, dirty, disgusting, … vulgar. So I might regret posting this up at some point in the future, but I am so GOSH DARN PROUD of my hardcoreness (?). 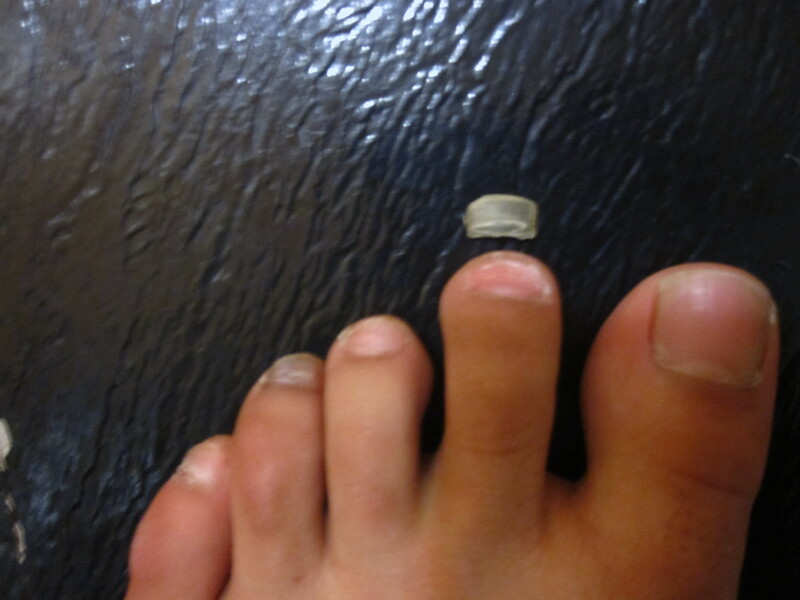 You see, my first toenail has officially fallen off! 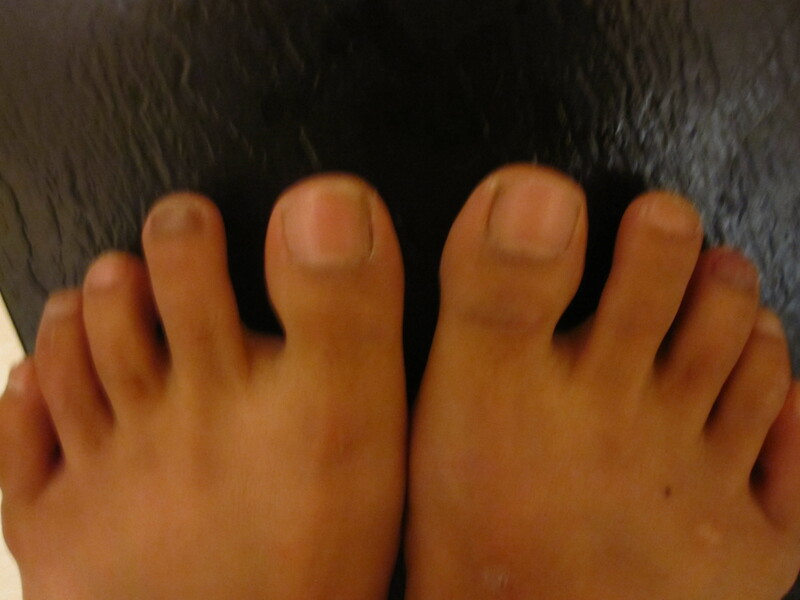 Look at the physical beauty of my toes. No, seriously though. It took hard work to get them to look like this! I definitely sped up the process, excitedly wiggling it like the loose baby tooth it was. So I have 3ish runner’s toes right now (I swear my shoes are big enough; I think it’s the downhill running). I haven’t been doing anything to them because I thought they’d just turn purple and then heal. I kept reading about toenails falling off but mine seemed to be firmly attached, so I just ignored that part. Well, just right now, I’ve realized that my first runner’s toe, the one I got over a month ago from my first half, is… loose. I can wiggle it like a baby tooth. 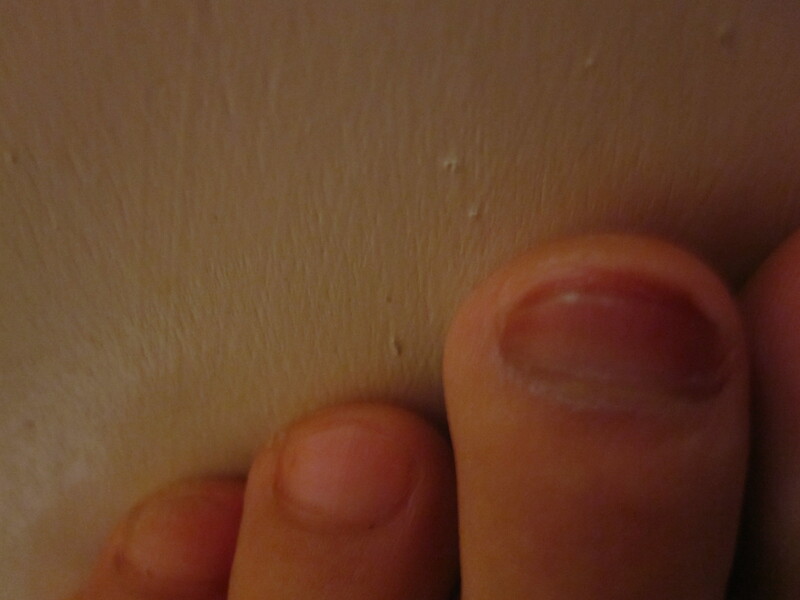 I’ve never lost a fingernail or toenail before, so this is quite exciting, but I’m also a bit alarmed – I might have a fourth runner’s toe in the works and it looks like I’m going to have a lot of toenails falling off. I’ve got to do some reading about when to “relieve the pressure” in order to save my toenails by burning a hole in my toenail. I’m frankly quite a bit more scared about this remedy than nails falling off – by the time my toes turn purple, they’re no longer in pain, so when do I burn the hole? Okay, I must be doing something right because I’ve hit STARVING mode on all of my runs the past week, whereas running over a mile used to make me throwup-nauseous. The thing is though, is that I really like the feeling of running with a flat stomach. And I even drink about three glasses of water before I go on my runs. Maybe it just runs through my system that quickly? Still, I’m starting to get so hungry (and earlier in my runs) that it’s starting to become distracting to the point of being my main focus. I’m going to experiment with taking just ONE bite of something “sticky” (aka high in protein/fiber) and see if it quiets my stomach just a little. Update on my rainbow toes. You’re SO welcome! My left second-toe is still healing from the half-marathon; it probably turned black because my left foot is 1/2 size larger than my right. My right third-toe is black from running downhill on the fire trails, and my right fourth-toe is beginning to darken from the same (my right fourth toe is actually about the length of my third toe). All of my toenails are keratinizing (? ), and all the tips of my toes are callusing. Ballet starts today; I do not think I’m bringing my pointe shoes. ;) I’m still 8th on the waiting list, oh please oh please let me in! On Friday I did 16 miles, P90X, and Insanity. I am still sore. Maybe I’m just imagining it, but when I look at my abs in the mirror I swear I can see more definition than before.